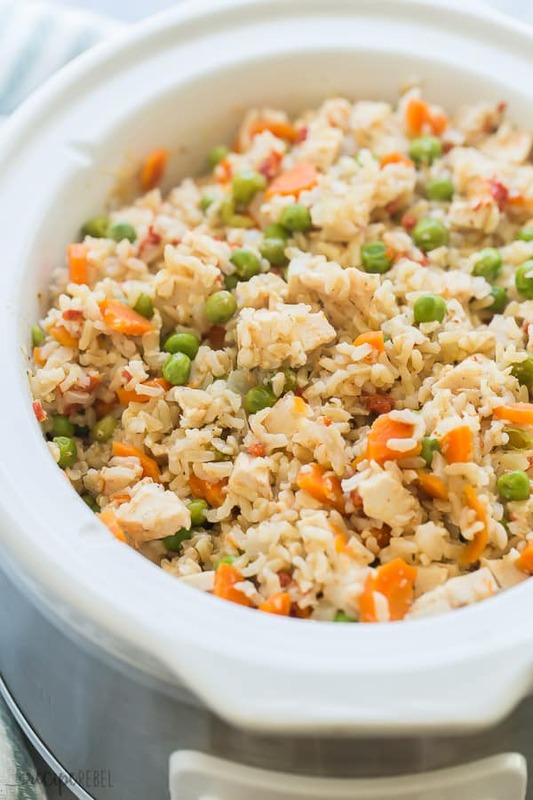 This Slow Cooker Chicken and Rice is easy, cheesy, and loaded with veggies, fiber and protein for a complete slow cooker dinner that the kids will love, too! 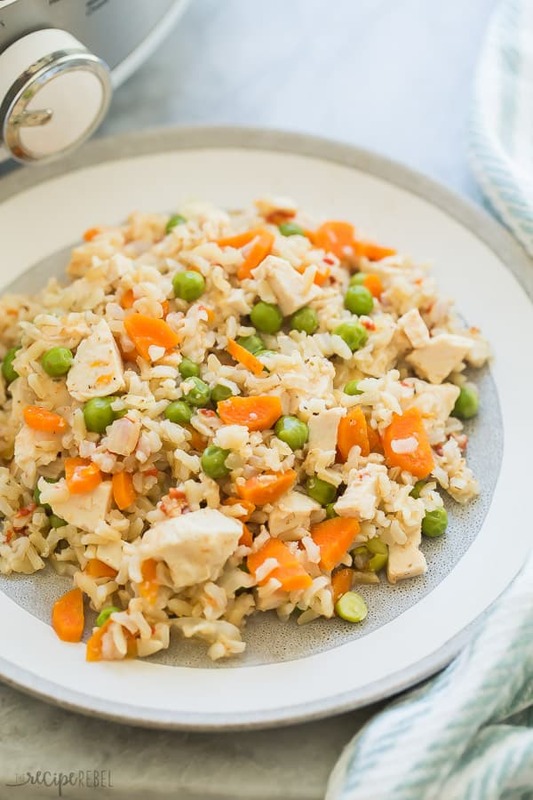 Back to school is nearly upon us so we’re busting out all the easy crockpot meals, and this Slow Cooker Chicken and Rice is at the top of the list! I’ll be honest, with 3 kids 6 and under I don’t have a lot of prep time for meals. They keep me on my toes (and the 9 month old keeps me chasing her around the house all day! ), and if I can provide them with an easy, healthy meal that I didn’t have to spend a lot of time making? I’m down. 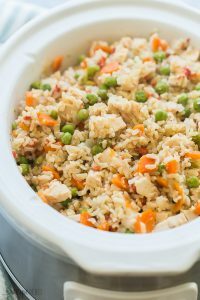 What I love about this Slow Cooker Chicken and Rice is how easy it is to customize to your family’s tastes. 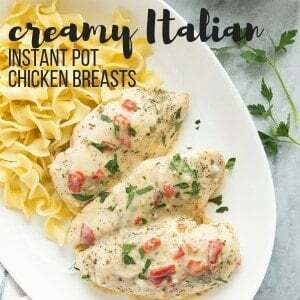 You can add in different veggies, different seasonings, different cheeses, and really make it your own (i.e., make it so that you know it won’t be a fight at dinnertime!). Another thing I love? That there are no extra pots or dishes. 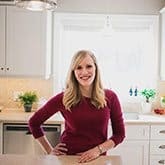 A cutting board and a slow cooker is about all you need here, and I’ve given you a few ideas below for how to make this even easier (with even less dishes!). It’s also naturally gluten-free (check your labels) and can pretty easily be made dairy free as well. First, we add the veggiess, low sodium chicken broth, seasoning and chicken breasts to the crockpot. You want to make sure your vegetables are chopped finely so that they cook in the same amount of time as the chicken (because nobody likes overcooked chicken!). Then we add the instant rice, and it soaks up all the extra liquid and cooks up nice and fluffy (so easy!). Lastly, we stir in a little milk and cheese to give it a touch of creaminess (and because my kids eat anything with cheese in it!). Try swapping out the vegetables for ones your family enjoys more: broccoli (add it with the rice at the end! ), mushrooms, zucchini, corn, fresh peppers, etc. Use boneless chicken thighs instead of breasts if you prefer (just take the skin off first!). Mix up the seasonings and cheeses to create something entirely new — especially fun if you’ve made it once as is, and now want to create a new variation to add to the recipe box! 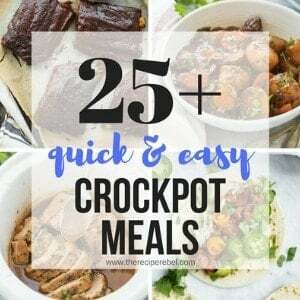 Love easy slow cooker dinners? Try these! 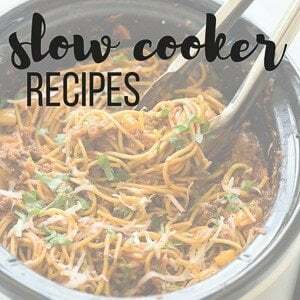 In a 3-4 quart slow cooker, stir together the broth, carrots, onion, red peppers, Italian seasoning, garlic, salt and pepper. Add chicken breasts, and cover and cook on high for 2 hours or low for 4 hours. When chicken is cooked, remove and place on a cutting board. 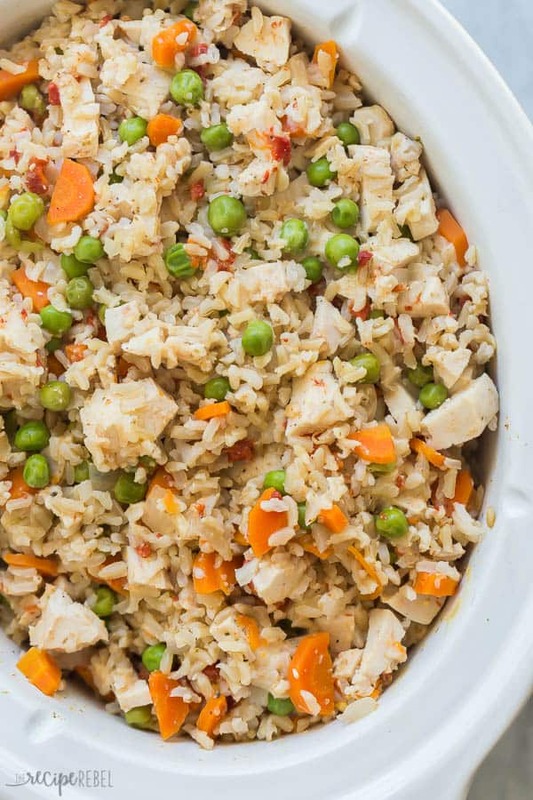 Stir in the peas and rice to the slow cooker, cover and cook on high for 15 minutes. When chicken is cool enough to handle, slice thinly. After 15 minutes, stir the chicken, milk, and cheese into the slow cooker. Cover and cook on high for 15 more minutes, until cheese is melted and rice is tender. Serve. Don’t have chicken broth can I use water? If yes how much should I use? Our instant rice takes about 5 minutes on the stove. I hope that helps! Can this be frozen easily? If so, do you have any tips for freezing and/or warming? Yes! Rice freezes extremely well. I would package it in freezer packs, squish it into a thin layer and freeze flat. Then thawing will be a breeze — just leave out at room temperature for a few hours and toss into a skillet with a splash of water.